I got this book from the library because I'd liked writer Matthew Sturges' work on Jack of Fables and Final Crisis Aftermath: Run!. 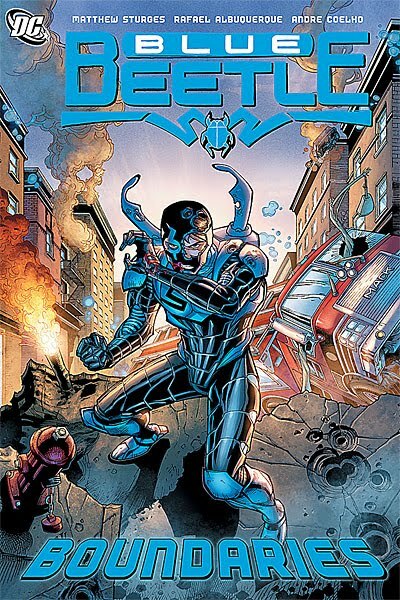 I'd seen a few issues of the new Blue Beetle reboot (now cancelled; sorry, Rogers) and hadn't been terribly impressed, but figured I'd give it another try. Yeah. Still not impressed. There's nothing actually wrong with this book, and it's got some interesting elements built into the teenaged-superhero premise, but the pieces just didn't jell for me. Too much Spider-Man, not enough Buffy the Vampire Slayer. But props for name-checking some real science, even if there's a lot of hand-waving in the implementation. Comic Book Report: Therefore, Repent! SnoutCast #22: "Fudge, Food, and Feedback"
Friday Flash Fiction: "Life Goes On"
SnoutCast #21: "The Trouble with Music Clues"
SnoutCast #20: "Toys vs. Games"
Friday Flash Fiction: "Dickly Departed"
SnoutCast #19: "Shinteki Decathlon 6"
SnoutCast #18: "Win, Lose, or Fun"